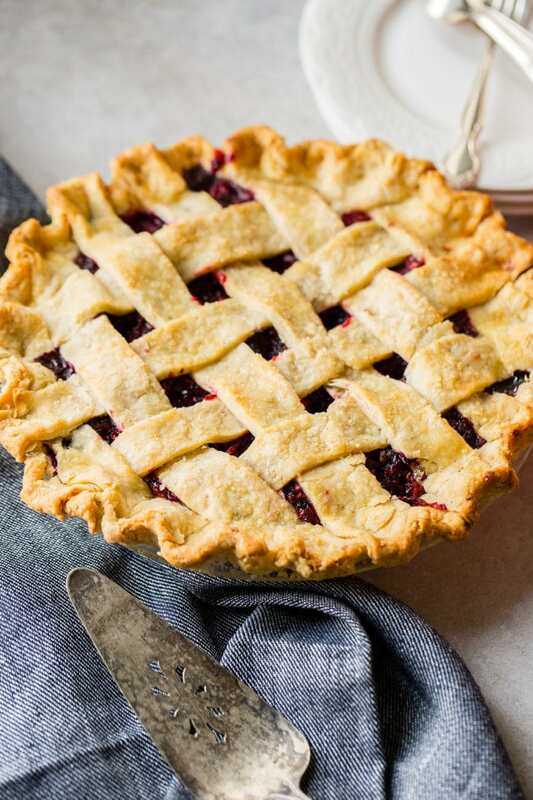 I’ve searched for the perfect razzleberry pie recipe and I’ve found it! Razzleberry pie or mixed berry pie has raspberries, blueberries and blackberries. I don’t know about you, but I absolutely love pie. I mean, I’d take a slice of this mixed berry pie over just about anything else. Cade is still a pretty big chocolate chip cookie fan, but he loves this pie recipe as well so that’s saying a lot. When I was a little girl in Washington state I quickly learned about a very special berry, the marionberry. It’s a cross between a raspberry and a blackberry and it’s not something you can get everywhere in the US. It is sweet and packed full of more flavor than any other berry which is why it is hands down my favorite. Marionberry pie is especially wonderful. Unfortunately when you live in Utah you’re just not going to get your hands on Marionberries so the perfect razzleberry pie recipe is the next best thing. Alright, maybe you’re wondering, what is a razzleberry pie? It’s the exact same thing as a mixed berry pie. It’s raspberries, blueberries and blackberries all baked into a pie. 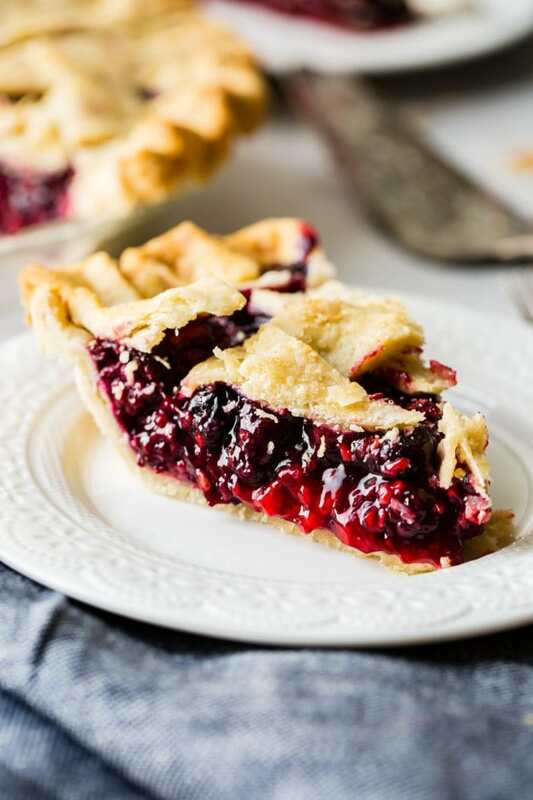 Unlike other berry pies that are tossed with a sweet gelatin mixture, this pie filling is cooked with a little sure gel or cornstarch as a thickening agent and then finished off in the oven. The different combinations of berries come together and taste similar to a marionberry, sweet, and full of flavor. Generally you do not use strawberries in a razzleberry pie, but I won’t tell if you insist. Obviously anything fresh is going to have better flavor so I do try to buy fresh berries for this pie, but if you need to go frozen that definitely works too. Just make sure that you only buy frozen fruit and never the fruit that is frozen with a simple, sweet syrup. That’s a different ball game and we don’t need the extra syrup. 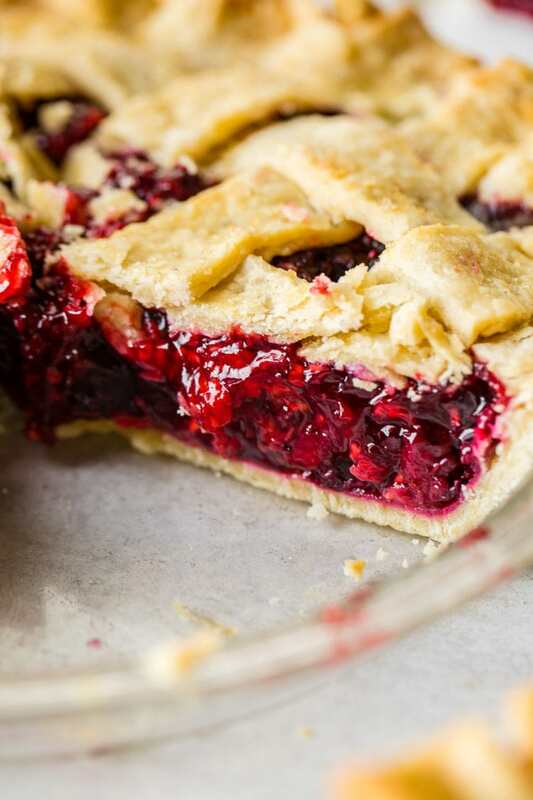 There are a few different ways that you can thicken a berry pie. There’s corn starch, flour, sure gel, and tapioca. I’ve tested them all so much it’s almost ridiculous, but it has helped me make a clear decision on which is best so let’s go over the ways. 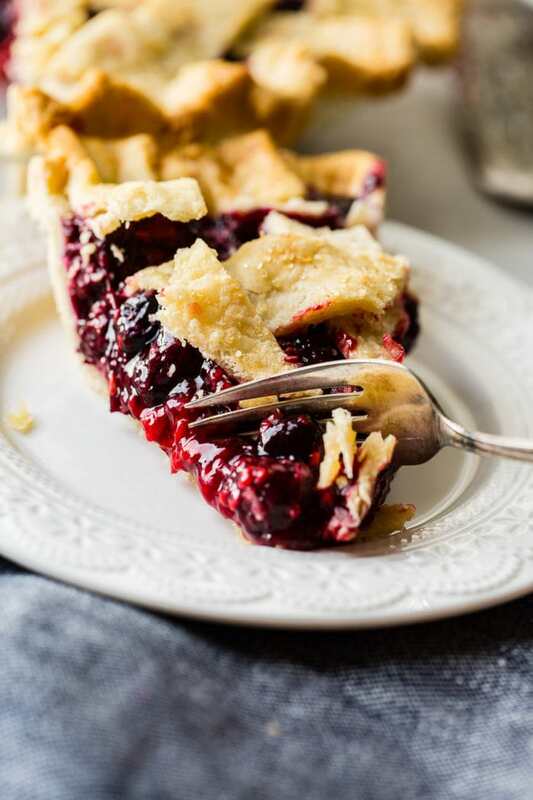 Just scroll past the recipe and we will go over everything you need to know about how to thicken a berry pie. I always use Mom’s Fail Proof Magic Pie Crust Recipe because as easy as pie crust is, it’s also pretty easy to mess up. I stick with the recipe that’s easier on beginners but still just as flaky and perfect as an expert pie maker would use. I've searched long and hard for the perfect razzleberry pie recipe and now I've found it. Razzleberry pie or mixed berry pie has raspberries, blueberries and blackberries. Prepare the pie crust and shape half of the dough into a pie plate. Slice the other half into strips and cover both with plastic wrap and place in the fridge. Add the fruit, sugar and pectin into a saucepan and gently, using a rubber spatula, fold the berries in. Start with only 1/2 cup sugar, but if your berries are extra tart you should add more sugar, 1 tablespoon at a time. Turn the heat to medium low and cook until the berries are releasing their juices and beginning to thicken. Only stir occasionally as you don't want to break up the fruit and turn it into jam. Add the hot fruit mixture directly into the pie crust. Place strips across the pie and then lift up one end of every other strip and lay a new strip across the other way. Now, repeat but with the other strips that were not originally lifted up. 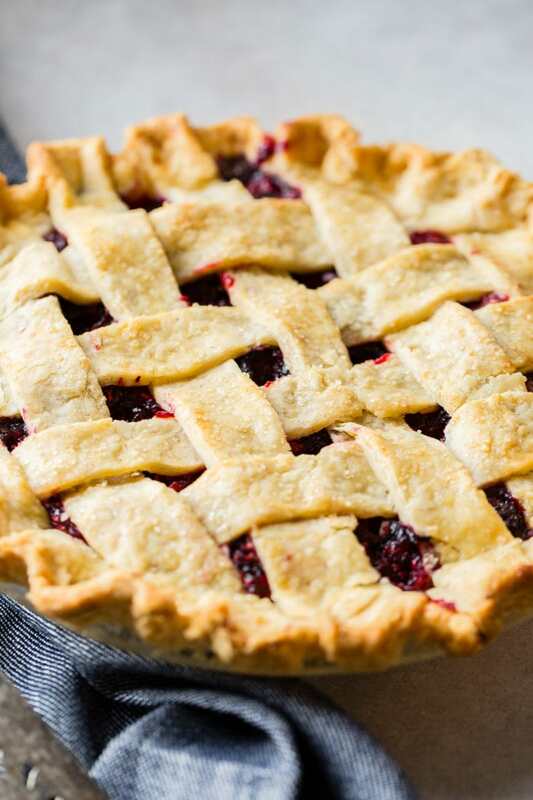 Continue until you're halfway across the pie then turn the pie around and repeat from the other side to make a lattice across the entire pie. Whisk together the egg and water and then brush the top of the pie and immediately sprinkle with sugar. Bake the pie for 25 minutes then drape with a piece of tin foil and continue to bake for another 20-30 minutes, or until the filling is bubbly and the crust is golden brown. Remove from the oven and cool entirely on the counter. We prefer to let our pie rest over night as the filling will set up and not run. Refrigeration can make the filling sink and pull away from the crust. This is actually my least favorite option. No, it doesn’t taste like flour or chalk as you’ll read below, but we’ve had some pies turn out perfect and others never set up with Tapioca, that’s too risky for my liking. To thicken a pie with tapioca you’ll need to use a lower temperature in order to open up the starches and allow the gelatinization to occur. Flour doesn’t need high temperatures to thicken, so it’s ok to cook it a little lower and not turn the berries into jam, but you do need more flour to thicken, about 1 1/2 times more than other thickening agents which is why unless it’s soup I’m not a fan of flour to thicken things. When you have to add in that much of a thickener, and the thickener is one that tends to have a gummy effect on food it can really ruin a pie. I especially don’t like that you can often taste flour in pies, especially berry pies. Now an apple or pear pie actually does pretty well with flour, so don’t stress too much that I’ve ruined flour for you. Cornstarch thickens a little better than flour but needs higher temperatures to thicken the berry filling. Make sure you toss it with sugar first and then add it to the berries to help it disperse better when it’s cooking. Corn starch doesn’t leave as gummy a texture and you won’t get the flour taste, so it’s our #2 choice for pies. We do have one quick warning, corn starch can actually lose it’s power if it’s over heated so it’s not a 100% method for pie making. And it can be a little chalky so make sure you don’t add too much. Ultra Gel is a gluten-free, non-GMO cornstarch that can be added directed to any liquid, hot or cold, for instant thickening, without the starchy, chalky taste of flour or corn starch. For apple pies you’ll want to use about the same amount of Ultra Gel as flour or cornstarch while a berry pie needs more like double the amount of Ultra Gel because of the liquid involved. Ultra Gel is hands down the best way to thicken pies. It’s a clear gel which is every baker’s secret weapon. The fruit will look clear and shiny while other thickeners will look cloudy. The best part is that it works every time. Unlike other thickening agents that can be overheated and fail to work or clump as you stir together the fruit, this gel is smooth and easy. It’s about the same price on Amazon as it is in the store, so in order to save myself the time and gas I’ve started just buying online. So, while you can certainly use one of the above thickeners, this really is the best one around! 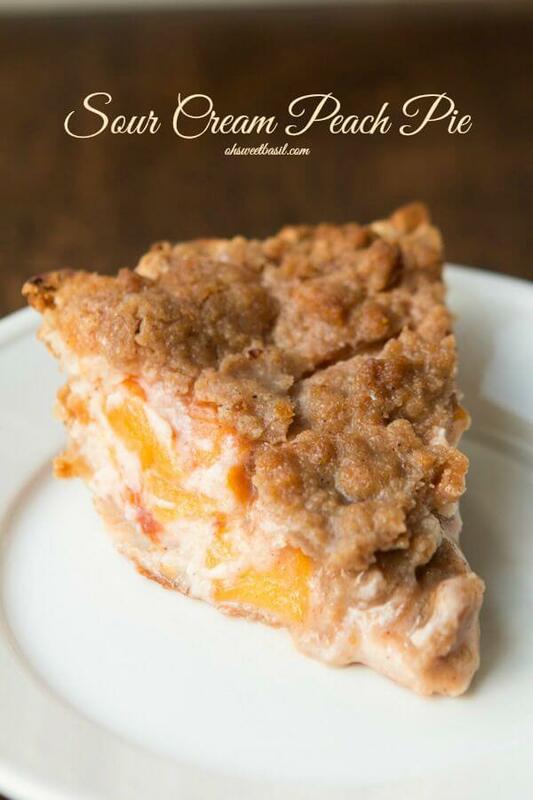 Full of juicy peaches this sour cream peach pie is creamy and delicious! Hello! I’m all set to make your pie for the holiday tomorrow. But I can’t find the Cornaby’s Ultra gel in any stores where I live. Can I substitute cornstarch? If so, how much? Just finished baking this pie! I’m very much a beginner baker, so I feel silly asking this question, but can it be reheated? I wanted to set it over night like mentioned above, but don’t want to mess it up if I warm it up again. If it can be reheated, what do you recommend? p.s. LOVE all of your recipes. Buttermilk pancakes are a fav in our house! Thank you so much Sarah! This is a pie that would be eaten room temp or cold, if you wish to eat it hot you’ll want to microwave your piece. Would make again but, not cook the fruit in a pan prior to putting in pie crust. Macerating the fruit in a bowl while the bottom crust blind/pre bakes is enough. I added 1 cup of sugar and 1/2 cup corn starch. My berries still taste tart in the end resulting pie, maybe my berries are out of season ? I used blackberry, raspberry, and strawberry. I’m not a fan of blueberries. 10 cups of berries was expensive. Also will try using frozen fruit too, it’s easier to keep long term, for pies all year round. I might try using brown sugar in the fruit filling next time. It did not set up well for me, even after being refrigerated uncovered all night. It set up, just not as picture perfect as yours did. I followed the recipe for the filling exactly, which states to cook the fruits with sugar and the thickening agent on medium but then I turned it up to med-high. I strained a lot of the juices out and glad I did because my pie over flowed during baking. Luckily I had put it on a pan to catch the drips. I used an all butter crust recipe, work fantastic. I will try this again someday. Yay! Great tips! Thanks for stopping by and leaving a comment! Hmmmm, was the fruit extra big or juicy? Unfortunately berries all end up different so if you have extra juicy berries you’d want to increase the thickening agent and like you did, drain anything off. Half way thru the cooking process of following this berry pie recipe to the Letter. I could already see the filling would never ever set up. It is in the oven now. I’m hoping I didn’t just make berry soup. I doubled the cornstarch while trying desperately not to pulverize the berries in the sauce pan, that like asking water not to get wet. Next time I think I will not pre-cook the fruits. Oh no!!! I’m so sorry! Cornstarch is so tricky! Did you cook it at a pretty high temperature? Cornstarch has to be cooked at a pretty high temp to thicken which means you have to take extra special care to not burn the berries. Hi Emmi, most of the setting up will occur during the cooling if you used cornstarch. That pie looks so good! I am going to the store this afternoon! One wee bit of “advice “—Give the photographer a raise! He or she makes the pie look so good, I could taste it, just by looking at it! Thank you for the recipe. I like pies far more than cakes, cookies and other sweets. 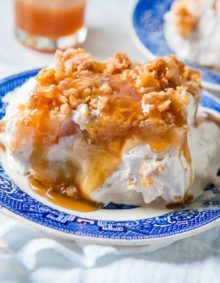 I do not love all pie equally – this makes my tastebuds tingle – I can’t wait to try this! It reminds me of a pie I’d get at Perkins but I think making it myself will be so much better. Just a regular pie plate. You pile the filling in and as it bakes it will go down a little, if you don’t use all of the fruit the top will sag down. Please clarify the amount of thickening agent for each type of pie you mention, for each thickening agent. You didn’t address tapioca, for example, and I’m trying to figure out how much corn starch for a berry pie. Is it double the amount, or the same as the ultra gel? Can’t figure it out from what is written here. Your recipe looks amazing! I need to find the Ultra Gel and I will be making it. I love Razzleberry Pie but need to make it gluten free. 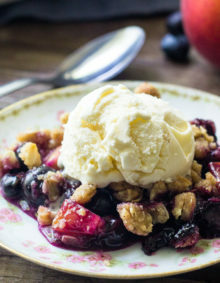 This is the first recipe I have seen that looks close to the ones from Marie Calender’s or Claim Jumpers, but I love the fact it is homemade and uses fresh fruit instead of a frozen pie already made that is just baked in the oven. Can’t wait to make it!